While every Russian is familiar with buckwheat porridge – which can be served for breakfast, lunch or dinner, the ingredients for the simple dish weren’t always so easy to come by. This time I am making a breakfast meal I am very well acquainted with. Every kid I knew grew up on it, and I’m pretty certain all Russians have loved it at some point in their lives. It’s grechka, the ubiquitous buckwheat porridge that is served not only for breakfast but also appears as a side dish at lunch or dinner. Buckwheat has to be sorted before cooking, and as a kid, I always had the task of picking out all the bad grains. I remember sitting at a table filled with uncooked buckwheat, talking to my mother, grandmother and brother while sifting through it – it was a bonding experience for every Soviet family. There are different ways of cooking buckwheat, and someone adept at a particular method will insist religiously that his is the only way. 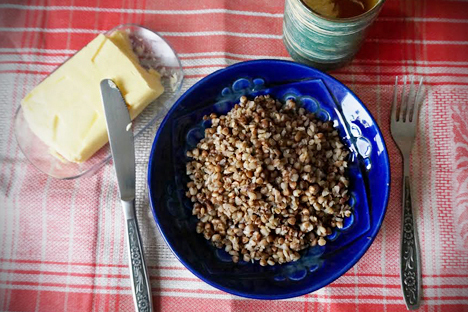 The Book suggests several options for additions to buckwheat, including cooking it with butter, eggs, liver, mushrooms and onion or even brains. When it’s ready, you’re supposed to wrap it with blankets and leave it in a warm place for a few hours. My grandmother would often disappear into the bedroom before serving breakfast or lunch, where she would unwrap a pot of porridge that had been lovingly tucked in her bed. One also had to check the bed for pots before settling in for a nap – it was a mistake you only made once. In preparing my buckwheat porridge, I went for the simplest version: grechka with butter. It seems like all the ingredients for it should have easily been available in the Soviet era and yes, they were, but mainly in Moscow. As a typical Muscovite, I tend to forget about the existence of the rest of Russia – not a trait I’m proud of. My mother and grandmother are also from Moscow, but my dad is from Kursk, a city about 300 miles south of Moscow, reachable by overnight train. His mother was born in Moscow, but was evacuated from the city during World War II and wasn’t able to move back as it was very difficult to get permission to live in Moscow after the war. The life of my dad’s parents in Kursk was quite different from that of my mom’s parents in Moscow. My Kursk grandparents couldn’t even get such basics as butter, sour cream or salami. So, my Moscow grandparents would go to the train station and bring a food parcel to give to the train conductor, which the Kursk grandparents would collect on the other end. Trains between Moscow and Kursk would leave around midnight and arrive early in the morning – so this transfer of goods naturally required quite an effort from both sides to put that piece of butter on their morning buckwheat porridge. I can imagine my paternal grandfather on a dark winter morning taking the bus to the train station to pick up the food before going to the local university, where he taught medicine. He probably kept his butter in a fridge at work before he could take it home. Overall, the distribution of food across the Soviet Union was appalling: “There were tour buses full of people from other cities pretending to be interested in the Kremlin and Red Square,” my grandmother said. The grechka I made turned out nicely – although not as good as my grandmother’s: I didn’t have the time to let it steep in warm sheets. It does need a lot of butter, as otherwise it’s very dry. Lucky for me that despite the sanctions, it’s still possible to buy French and Finnish butter in a few Moscow shops, so I don’t have to go to the train station to wait for the train from Helsinki to get some – at least not for now. Bring a pot of salted water to a boil. Add buckwheat and cook, stirring, until thick – about 15-20 minutes. When the porridge is thick, cover tightly with a lid and remove from heat. Let sit in a warm place 3-4 hours. Add butter before serving. For 2 cups of uncooked buckwheat, use 3 cups of water, 1 teaspoon salt and 2 tablespoons butter.